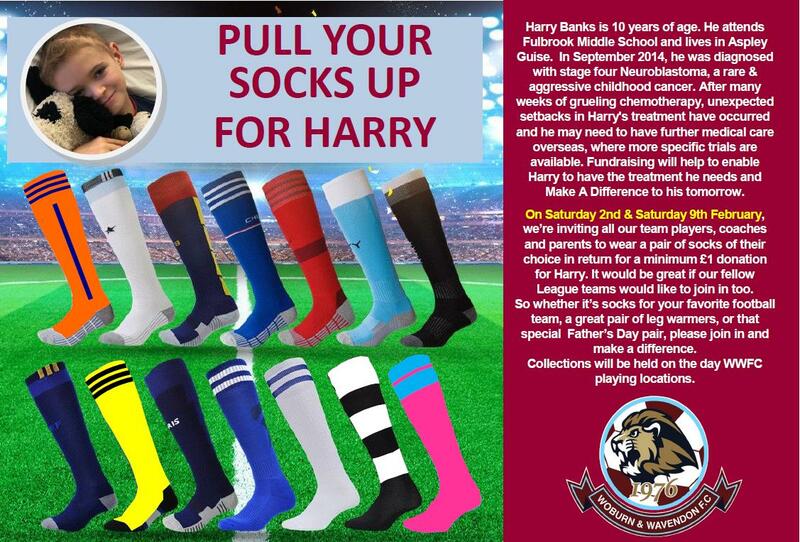 Woburn & Wavendon Football Club » We’re pulling our socks up to support Harry! We’re pulling our socks up to support Harry! We previously shared the story of a local boy called Harry Banks (Mad About Harry) who is 10 years of age, attends Fulbrook Middle School and lives in Aspley Guise. As a club, we wanted to lend our support to Harry and have spoken with our local leagues and Bedfordshire FA about fundraising over the next 2 weekends (2nd & 9th February). We are inviting all our team players, coaches and parents to wear a pair of socks of their cho…ice in return for a minimum £1 donation for Harry. It would be great if our fellow League teams would like to join in too. So whether it’s socks for your favourite football team, a great pair of leg warmers, or that special Father’s Day pair, please join in and make a difference. We have set up a Just Giving page for people to donate and arranged for collections to be held at WWFC playing locations on the day.